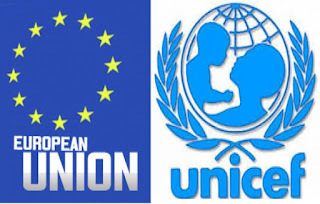 The United Nations Children’s Fund (UNICEF) on Monday, said that poor access to portable water, improved sanitation and hygiene (WASH) have a link to increase in diarrheal diseases which has been known from research to affect a child’s nutritional status. Ms Mainga Banda, a UNICEF Water Sanitation and Hygiene (WASH) Specialist, who spoke at the opening of a Media Dialogue on WASH in Awka, Anambra stressed that improving access to WASH reduces diarrhea diseases. Research shows that about 45 million under-five global children die annually from diseases caused by poor access to water, sanitation and hygiene. At the event which was organised by the Child Rights Information Bureau (CRIB) of the Federal Ministry of Information in collaboration with UNICEF with support from European Union (EU), she corroborated research which shows that frequent diarrhea causes undernutrition. According to statistics from a study titled, “Multi-country analysis of the effects of diarrhea on childhood stunting,’ “Diarrhea diseases can also affect a child’s nutritional status. “25 per cent of stunting in children under the age of two could be due to five or more diarrhea episodes,” the study added. It added that diarrhea causes death by depleting body fluids resulting on childhood growth and cognitive development of a child. Similarly, it said that sanitation in Nigeria is declining and called for concern even though the country is investing more on sanitation. Banda also noted, WASH has a critical role to play in the not only in reduction of diarrhea disease but, in prevention of Neglected Tropical Diseases (NTD) which is silent killer of childrern as well as diarrhea. Bemoaning the impact of poor WASH on children’s health and development, she stressed that the problem is a multi-sectoral one which requires multi-sectoral approach to tackle it. Earlier, Mr. Olumide Osanyinpeju, Deputy Director, Child Right Information Bureau of the Federal Ministry of Information and Culture commended UNICEF and EU for their continuous as well as huge support in ensuring that safe water, sanitation and hygiene are brought to the rural people of Nigeria through the WASH Programme is highly commendable. According to him, the issue of safe water and sanitation has been in the front burner of development issues in Nigeria because it affects a major segment of our society, a lot of who are children. Osanyinpeju said, “Water, Sanitation and Hygiene is very important in the life of a Child. “The Sustainable Development Goal (SDG) six clearly emphasises the importance of clean water and sanitation. Water and Sanitation are essential for the survival and development of all children, while simple hygiene such as hand washing can save lives. Earlier, Mr Geoffrey Njoku, UNICEF Communication Specialist, identified objectives of dialogue to include creation of visibility for WASH interventions, donors and to generate human interest stories for publication. Njoku said that it was an opportunity for journalists to develop human angle stories that would encourage Nigerian government to increase investments in WASH interventions.